This weekend I was reminded of God’s faithfulness to His children as I watched my friend smiling and laughing with a friend he hadn’t seen since his surgery. It was a happy reunion as the two—like schoolboys—caught up on old news. Both are walking testimonies. Both have had open heart surgery. The elder—in his eighties—has been in and out of the hospital this past year. Twice, we’ve feared for his life. Yet God decided his journey wasn’t over. The younger, not feeling well, was diagnosed with a 100% blockage of the widowmaker earlier this year. Needless to say, God was indeed the strength of his heart. He is doing well. Thank you for your prayers. On the other hand, I’ve watched several family members grieve the loss of a loved one who unexpectedly slipped from this world. Yet, through their struggles, God is still faithful in the midst of their heartache. Why does He choose to leave some, while others are taken? I don’t know. But, I do know one thing. He has my best interest at heart. He loves me and wants the very best for me. So, with each heartache comes a choice. Do I trust Him when I can’t see His purpose? Easy? Sometimes. Other times, not so easy. At times, trusting Him has been the hardest thing to do. But through my heartaches, I’ve held on to His promises like a drowning man clinging to a life-preserver. Yes, I have hope in Him. I may not always see His hands or know His thoughts. But I can always trust His heart. Such an encouraging post, and you’ve included two of my favorite verses in here, Gail (Isaiah and Jeremiah). My aunt just had open heart surgery–in her 80s. Last I heard she was doing fine. You’re right. All we can do is trust that God has a plan and knows what’s best. His ways are truly higher! So glad to hear your aunt is doing fine. 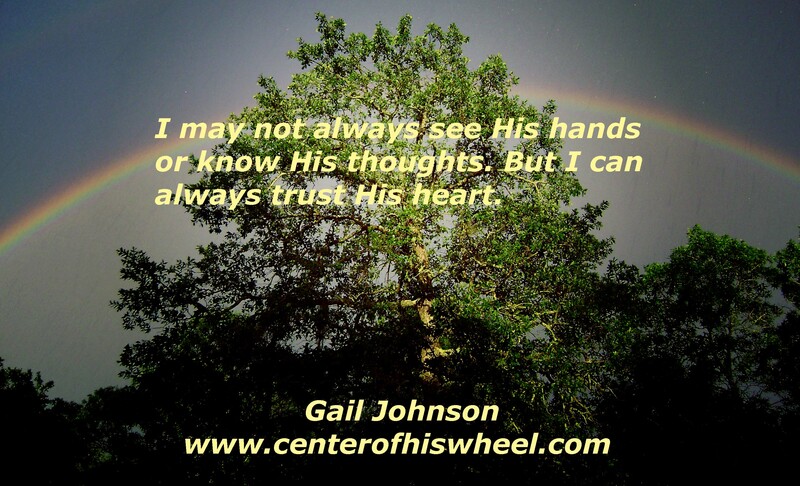 There have been many times when I couldn’t see what God was up to. But isn’t that what faith is all about? 🙂 I am thankful for this season in my life. The older I get, the more I’ve learned, He loves me and I can trust Him! Thanks for stopping by, Sandra.